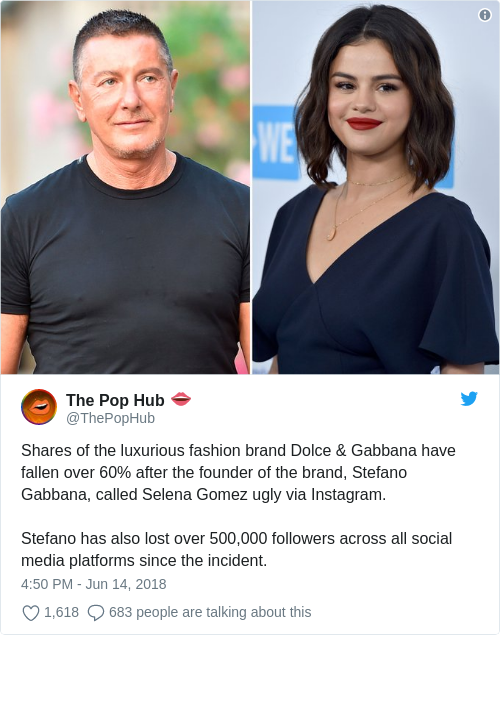 Yesterday Stefano Gabbana – one half of Dolce & Gabbana – caused an uproar when he called Selena Gomez ‘so ugly’ under this insta collage of the singer and actress. Gabanna left a comment under the insta – “è proprio brutta” – which roughly translates to “she’s so ugly”. Selena’s fans were rightly outraged by a fifty-something year old man bullying a young woman in her twenties. What that dck head said (if it’s true) is f**king false and total bull sht. Miley had a run-in with the designers last year, when she posted that she didn’t agree with the brand’s politics (despite being gay, the two designers don’t think that LGBTQ people should have children). We are Italian and we don’t care about politics and mostly neither about the American one! We make dresses and if you think about doing politics with a post it’s simply ignorant. You’re tired and over. Your homophobic, misogynistic, body-shaming existence will not thrive in 2018. It is no longer tolerable or chic. Please take many seats. But Gabbana refused to sit down and instead embraced the controversy. Obviously feeling no remorse, he posted a series of screenshots and articles on his instagram that made light of the situation. Toxic white male masculinity reigns supreme! Yaaah! However, Gabbana’s defiant stance is a bit idiotic because overnight D&G’s share price fell by over 60% and Stefano lost 500,000 followers across all social media platforms.